Professor Prins undertook his clinical training in endocrinology in Brisbane before completing a PhD in adipose tissue biology at UQ. He undertook his clinical training in endocrinology in Brisbane before completing a PhD in adipose tissue biology at UQ. Professor Prins then accepted a postdoctoral research appointment at the University of Cambridge, UK, based at Addenbrooke’s Hospital. He returned to Brisbane in 1998 after being awarded a Wellcome International Senior Research Fellowship. 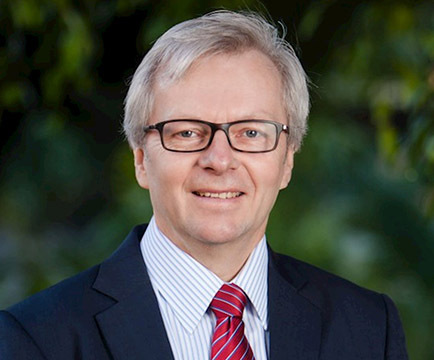 In 2004, Professor Prins was Founder/Director of the UQ Centre for Diabetes and Endocrine Research, one of the most prominent and successful research groups on the Princess Alexandra Hospital campus, which merged with the UQ Centre for Immunology and Cancer Research (CICR) in January 2007 to form the UQ Diamantina Institute. Professor Prins has substantial commercialisation experience, holds four international patents and was the founder and scientific director of Adipogen Pty Ltd, a spin-out biotech company. He sits on numerous Australian and international pharmaceutical scientific and clinical advisory boards. His current corporate roles include directorships of Metro South Hospital and Health Service ($2.3b) and the Mater Foundation ($80m). Professor Prins is an active clinician-scientist, a key opinion leader in diabetes and endocrinology in Australia and sits on numerous national and international scientific, clinical and educational committees and boards for the National Health and Medical Research Council (NHMRC), non-government organisations and industry.